Sometimes you have to choose between taking an action that is convenient for you or making a choice that is good for the environment. Think single-use plastic containers or big SUVs. But some actions benefit both you and the planet. This is the happy result of installing native plants in the backyard. Native plants have numerous advantages for a gardener, but also work wonders for the planet. It's time to give this tough, beautiful flora a chance. If you live in California, here are some tips to get started. What Are California Native Plants? California is one of the world's biodiversity hotspots. The Golden State has more plant species than any other state, and at least a third of the plants native to California do not grow anywhere else. California's native plants are the foundations of our state's ecosystems, from oak woodlands to deserts, coastal dunes to redwood forests. The plants have adapted to the climate and soil, and they provide food and shelter to the native wildlife. Why garden with California native plants? Here are a handful of the top benefits, although there are many, many others. If you currently have a traditional garden, with a lawn and flower beds, you will save time by bringing in local California natives. These are plants adapted to your climate and that know how to grow in even the toughest environments without help. You spend money in the garden on irrigation, fertilizer and chemicals or pesticides to keep down bugs and weeds. A garden of California native plants requires less water and no fertilizers or pesticides. All of this is also good for the planet. Everybody is trying to save water, given the droughts California has experienced. Nothing drinks more water than a traditional flower garden and a turf lawn. Native plants are water-thrifty alternatives. If you are worried that you'll be stuck with a few lackluster native plants, you couldn't be more wrong. Thousands of Californians throng to see wildflower super blooms because of the incredible diversity and color. The state has more than 4,500 native plants, and many are highly ornamental. Butterflies, bees and songbirds are on the decline. Bringing wildflowers into your garden attracts and assists native pollinators, also bringing in native insects that wild birds rely on for food. Think of it as the chain of life. If you help one link, you strengthen the entire chain. So many native plants, so where to begin? Here are five, easy-care, native flowering plants that you can quickly incorporate into your garden. And after this? There are thousands more. 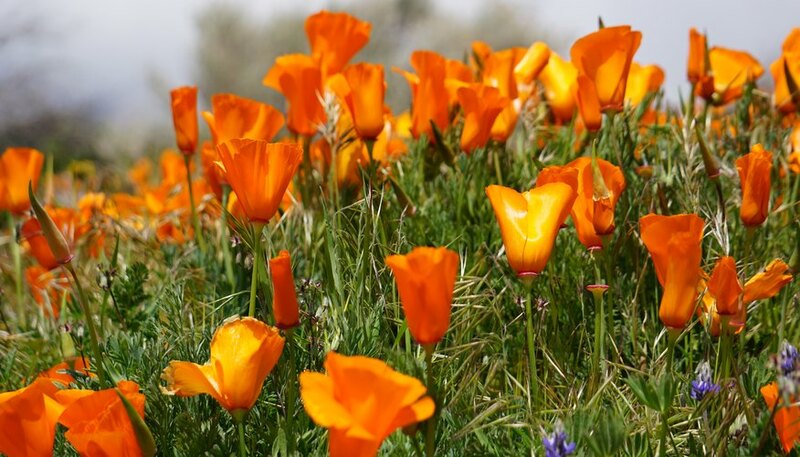 California Poppies (Eschscholzia californica) The official state flower is an orange charmer, and wildly popular. They are also extremely easy to grow in your back yard from seed. California Lilac (Ceanothus spp.) These evergreen shrubs with fragrant, deep-blue or purple blossoms light up your garden and attract pollinators. Irrigate the first year, then let them fend for themselves. Manzanita (Arctostaphylos spp.) Over 40 species of manzanita are native to California, ranging from 2 inches to 20 feet tall. All offer the famous, shiny reddish bark and also clusters of tiny pink or white flowers beloved by hummers. Native Sage (Salvias spp.) Hummingbirds wage bird battles over California wild sage, and the bright, colorful flowers are a delight in any garden. These salvias (there are at least eight native species) also provide nectar to bumblebees, wasps and bees. Lupine (Lupinus albifrons) California native lupine produces elegant silvery foliage to 3 feet tall and wide, topped with intense, indigo flower spikes in spring. Give this California native full sun and good drainage, then watch it send out its siren song to native pollinators. EMSWCD: What's So Great About Native Plants?